In a blender, puree tomatoes, roasted peppers, garlic, onion, 1/4 cup olive oil, cilantro, paprika and salt. Pour into a large skillet, add rice and saffron threads. 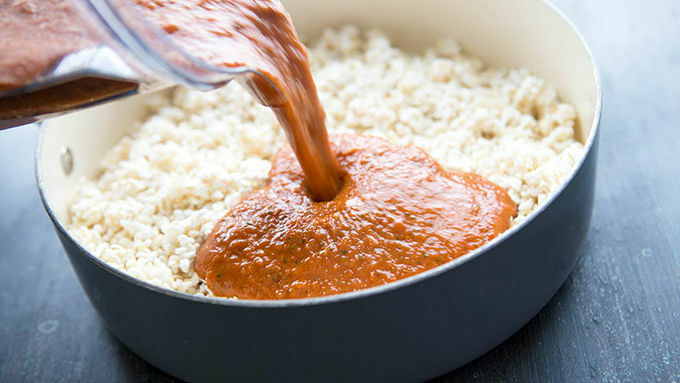 Heat over medium-high heat until the rice has soaked up all of the sauce. Remove from heat, cover with a lid and set aside. In a second large skillet, heat the remaining 1/4 cup olive oil over high heat. 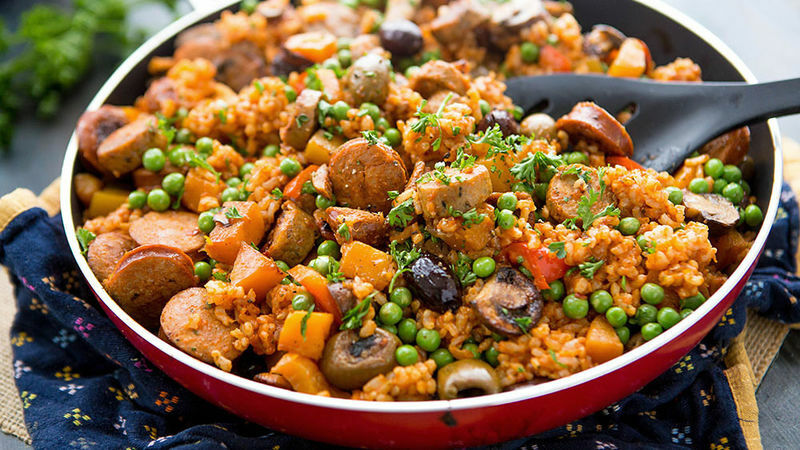 Toss in bell peppers, mushrooms, butternut squash, sausages and olives. 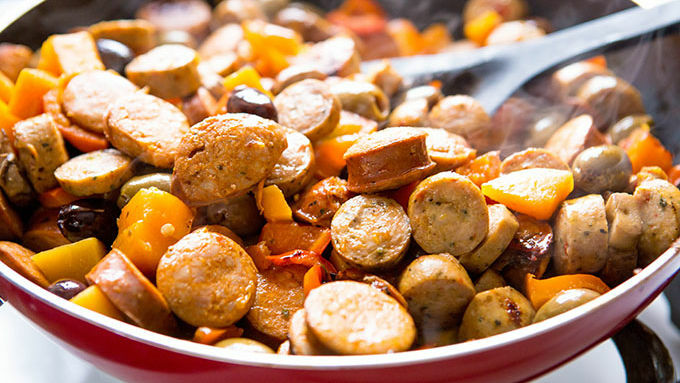 Cook until the edges of the sausages turn golden brown and vegetables become tender (about 6-8 minutes). Transfer vegetables to the rice skillet, tossing until well combined. Return skillet to heat, turning to medium, add peas to the skillet and cook until warm (about 3-4 minutes). Fold peas into the rice mixture. Garnish with parsley. Serve and enjoy! For maximum authentic flavor and texture, purchase a bag of bomba rice online. 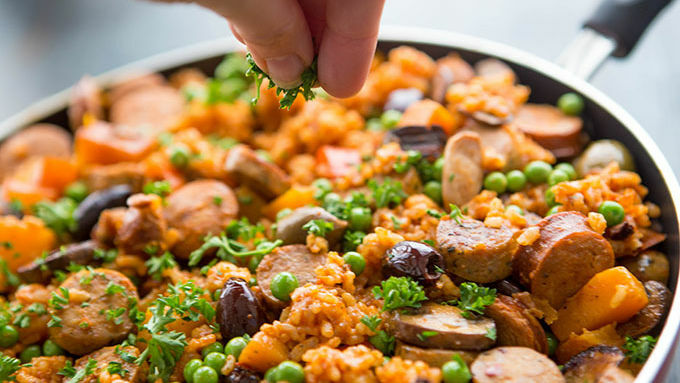 With a rounder, heartier texture, this delicious Spanish rice soaks up the flavors of the sofrito sauce and makes for an absolutely incredible meal. My boyfriend works in the Basque Country in Spain, and I knew he was something special when, the first day we met, he admitted to spending most of the day ironing napkins after throwing a paella party the night before. “A paella party?” I inquired. Impressed, I listened fervently as he shared all of the measures he took to create an authentic skillet full of homemade paella. From shipping in Bomba rice to simmering sofrito (the aromatic sauce) for hours on the stovetop, to timing it all just right in order to serve up a perfect skillet of Spanish paella. I nodded, smiled, and secretly made plans to become his friend forever. Because any man who makes his own paella is a man worth keeping. Fast forward to last week, when I was craving a pot of homemade rice and veggies. Something warm and comforting, made with all the best winter ingredients. He suggested it sounded as if I was begging for a paella, so we decided to go in together and whip up some magic. My only request? We had to do it shortcut style. I couldn’t want for the hours it would take to recreate a perfect pot of the stuff. So, we had to find a way to hack it. The results, dear reader, were splendid. We grabbed spoons and dove right in. Winter cravings were cured, comfort food comforted. This pot of homemade Winter Paella was exactly what I was looking for. Looks like Mr. Right was right.